Enjoy the flexibility and increased bandwidth capability that QSFP MTP/MPO Fiber Optic Cables can provide. Cables Plus offers these cable assemblies in 8-strand QSFP+ (MPO/MTP�) to QSFP+, as well as 8-fiber QSFP+ to 4 X SFP+ (LC) configurations. For those needing a space saving alternative to standard fiber cables, QSFP+ cables are the right choice for upgrading, especially as performance demands become more challenging by the day. You need a high density solution that is up to the task, while saving you every inch of work space possible. 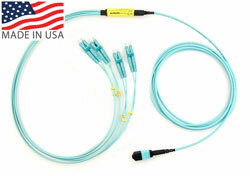 The QSFP+ fiber optic cables we provide are constructed using Interconnect Premise Nanocore fiber from Hitachi, and are suited to handle 8-Fiber 40G/100G/128G applications fiber applications in Singlemode and OM3/OM4 multimode. You choose the polarity and pinout configuration you need. CablesPlus USA builds your cable here in the USA, and puts every cable through rigorous testing to meet industry standards for interferometry and insertion loss quality. Our LightWave brand QSFP MTP/MPO fiber optic cables are 100% Trade Agreements Act (TAA) compliant, meaning they meet all the necessary conditions and standards for Federal Government use. Contact us if you need more information or assistance choosing the right cable, or use our Custom Cable Builder for specialized orders.